A practice is composed of one or more workouts. You can add multiple workouts to a single practice instance—one for each swimmer group. For example, you may have one workout geared toward sprint swimmers and another for distance swimmers. They will all need to be in the same roster group and location. Go to > Coaching Tools > Practice Calendar. Tap a practice to open it. If you do not see any practices, make sure no filters are active. If there are no practices in your calendar, you will need to schedule a practice first. Tap the MORE INFO button. Tap the coach(es) you want, DONE. Tap EDIT in the green bar at the bottom. Scroll down if needed and add Notes (phone) or Practice Notes (tablet). Tap the practice again if it returns to the calendar. Tap in the lower right to start adding workouts. Note all the different items you can add to a practice. For now, tap WORKOUT. We will cover all the other items in the ScrapBook lesson. Check the box by one or more workouts. You may use three search tools to locate workouts: Sort By, type part or all of a name in the Search for Workouts field, and Filters. Those that include a test set have a red dot after the name. You may also select from the W/O LIBRARY (phone) or COMMUNITY WORKOUT LIBRARY(tablet) tab at the top. You will now see subtabs listing the workouts you added. Tap a subtab to view that workout. 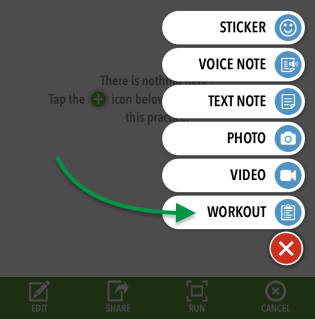 Tap the edit icon to edit the selected workout. 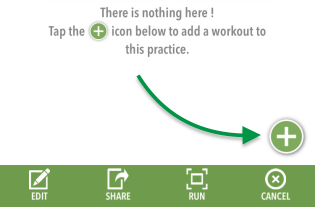 Tap the email icon to send the workout to people. The arrows at the top cycle through multiple practices. 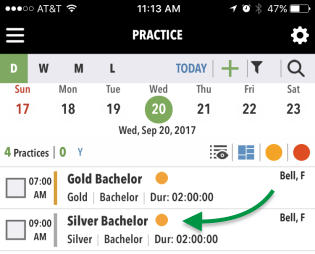 Unless you intend to immediately run the practice, tap in the upper left to return to the PRACTICE calendar. Now you are ready to run the practice.